Liz and Yvonne Kane are two young fiddle players from Letterfrack, in the Connemara area of Co. Galway, and have been making a name for themselves touring in particular with Sharon Shannon's band The Woodchoppers. Their style of playing is heavily influenced by the South Sligo tradition as well as that of East Galway, and in particular the music of the great composer Paddy Fahey, whose tunes are all over this album. For those who like their fiddle tunes in C and F (and in particular the minor modes) rather than the more familiar D and G, this will be a welcome addition to that classic 1970s Shanachie album by the great Kathleen Collins. As one might expect, the two sisters play very tightly together and, rather than playing off each other and making individual statements on the tunes, they choose to emphasize that powerful unison. In that regard, their album is reminiscent (in spirit, not in playing style) of another sibling fiddle album, Na Seighneáin/Northern Lights by Kevin and Séamus Glackin. 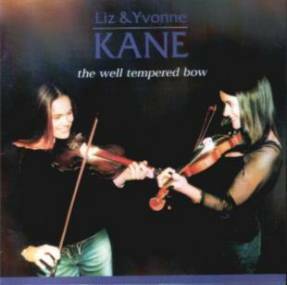 The Kanes are accompanied impeccably on guitar and piano by John Blake, a member of the band Téada. This review by Philippe Varlet was originally written for his Celtic Grooves Newsletter and appears here by kind permission of the author. For more information about Liz and Yvonne visit www.thekanesisters.com.